This project promotes the entrepreneurship of the youth from a young age on. 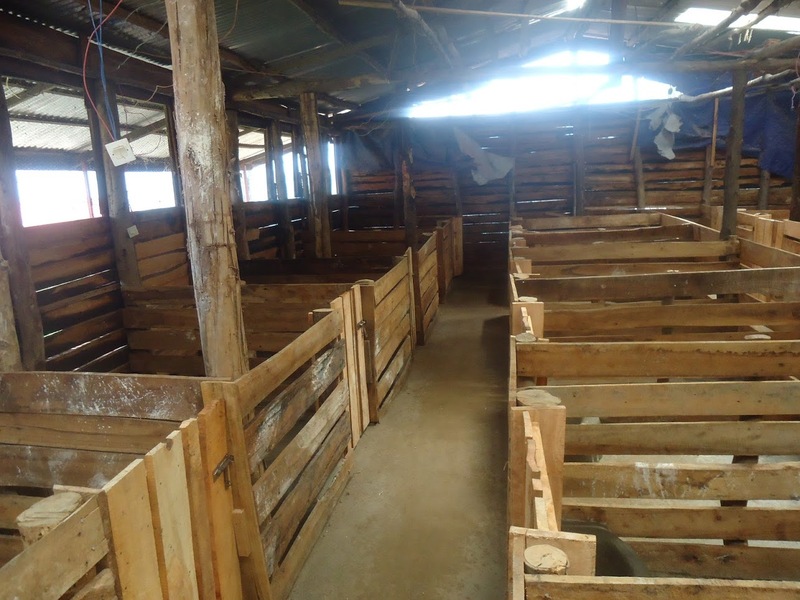 Purpose of the promotor is to teach them the theory and practice to grow pigs of an improved type. This all to support the school as the financial means are limited. Financial incomes are provided by the parents currently. The project will also improve the food quality for the students and exploit the leftovers from the kitchen of the boarding school. Personally I don’t see any risks related to the food; we can always rely on the leftovers of the kitchen. We can also purchase rice bran in the rice nursery of Bugarama and transport this with the car of the school. On top of this we will be able to cultivate food for the pigs. Also hygiene and health care will be under control. Medication is available; the vet of the monastery farm is available when needed. The follow up will be done by the personnel which is permanently available, supervised by the executive board. It took a while before the project started off by now all is running smooth. - The construction of the storage and the guard house as well as the canalisation of the waste and the waste pit digging are ongoing. We did not encounter any financial problems so far as the market prices are in line with the provided budget. The start of this project went very smooth in general and the progress is very satisfactory. The constructions of the small store house and the house for the guard are completed. The canalisation for the waste and the digging of the cesspool are finalised. We still have to purchase still a water tank and to install it to capture rain water. The mount basis for the tank is ready. Up till now the project is not yet cost effective. We did not have any big financial problems as we adapt to the new situation and unforeseen circumstances. To prepare for potential future problems we limit the expenditures. A small problem we faced was the increase prices for pigs. This resulted in less pigs to start the project with. 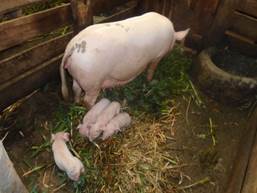 The project budgeted for 10 piglets of 4 months old (40.000 RwFr/piglet). At the moment of purchase this though was the price for a piglet of 2 months. 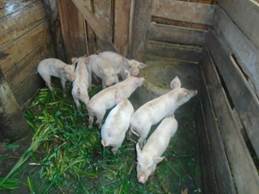 We opted for the purchase of: 6 piglets of 6 months old, a male pig of 8 months and an adult female pig. The last one will give piglets in March. This caused the expenditure to be higher than foreseen: 660.000 RwFr instead of 400.000 RwFr. The project is running well and fulfils all expectations. Since the report of January 4th 2017 a lot have changed. 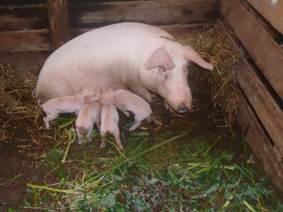 5 female pigs had piglets on 2/4/’17, 17/5/’17, 20/5/’17(2) and 2/4/’17 and the 2 others are pregnant. 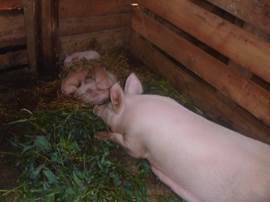 At this moment we have 25 piglets and 9 adult pigs in the stables. An additional advantage is that the animals are mainly fed by the table scraps of the students and the waste from the kitchen. Although we’re not in production phase yet and therefore there is no return we don’t see any problem in the execution of the project. 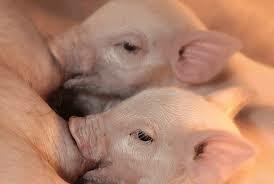 The setback we had was a big problem during the giving birth as several piglets were born death. Experienced people informed us that is often happening when giving birth for the first time. We got the advice to make sure the pregnant pigs get enough movement. Experience brings wisdom… we learned a lot. Our only concern, as the pigs are quickly multiplying, is that the stable will soon be too small (at the moment we already have 25 piglets). Pictures: To see the whole album, clic here!